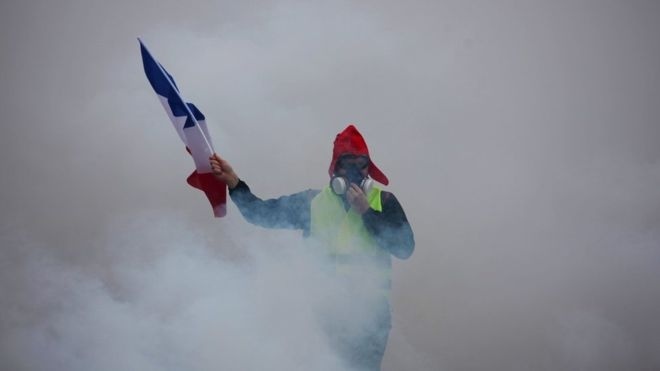 AKIPRESS.COM - The pictures of Paris swathed in tear gas, with burning cars and angry protesters rampaging through the streets in high-vis jackets demanding an end to a fuel tax rise have been seen across the world, BBC reports. That so-called carbon tax had already increased diesel by 7.6 cents per litre and petrol by 3.9 cents in the last year, and it was due to rise again in January. Yet as the rage over the added expense spilled into the cities and on to front pages, the original reason for the increase became somewhat lost. It was supposed to help reduce the country's reliance on fossil fuel-guzzling cars, part of a wider attempt to reduce emissions and curb the effects of man-made climate change. What's more, it would have been a chance for French President Emmanuel Macron to prove politicians could make difficult decisions when it came to the fight against global warming. But now his government has bowed to pressure and promised to suspend the tax rise for at least six months, which raises the questions: where does this leave France's fight against global warming - and what message does it send to the wider world? The protests are, in some ways, surprising. The French, in overwhelming numbers, believe in man-made climate change. According to a study released earlier this year by the European Social Survey, almost 94% of French citizens believe climate change is at least partly caused by human activity, with 73.7% believing the impacts will be bad. In comparison, 91% of British people believe climate change is partially caused by human activity, and just 66% believe the impact will be negative. Meanwhile, a report by the University of Michigan's Center for Local, State, and Urban Policy notes only 60% of Americans believe climate change is happening and humans are playing a part. France's fuel tax aims to encourage motorists to use their cars less or switch to electric versions. The tax would also raise €34bn ($39bn; £30bn), although according to news agency Reuters, just €7.2bn will go towards the environment. "Clearly the reason the yellow vests began to demonstrate was the so-called carbon or fuel tax," François Gemenne, a lecturer in environmental geopolitics at Paris's SciencesPo university, explained. "But I'm not sure this [postponing the tax] will calm them down - most of them are just against tax." Indeed, one of the leading members of the yellow vests - or "gilet jaunes" - appeared to almost echo these words. "The measures announced today do not satisfy us at all - for the simple reason they don't go far enough," Benjamin Cauchy told the BBC's Chris Bockman in Toulouse. "The French people want a complete political transformation. They want to change the way things have been for the last 30 years. We're sick and tired of taxes being raised and the quality of public services going down."